← What have you been pinning lately? What your students really want: Where technology matters the most! Posted on November 18, 2012 by Jessica Gaido | Comments Off on What your students really want: Where technology matters the most! We recently came across findings from an Educause survey asking college students about how technology is used by their instructors. 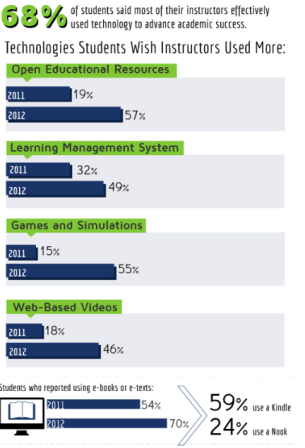 Not surprisingly, the amount of teachers using technology in their classroom has significantly increased since 2010! Today, 68% of students report that their instructors effectively use technology in the classroom. Yet, there is always room for improvement. Check out the areas below to see where students would like to see more technology sources utilized! This entry was posted in Helpful Tips and tagged Classroom Technology, infographic. Bookmark the permalink.